According to the statistics from 2018, more than ten people applied for every pharmacist job opening in the United States. Are you one of these applicants? Do you still try to win the race? To succeed in this interview is far from easy. You can not stand out with your knowledge, or with your education, because all job candidates who compete with you have a degree from pharmacy, and the same (or similar) knowledge of the field. So how to make a difference? You can stand out with great answers to their questions. 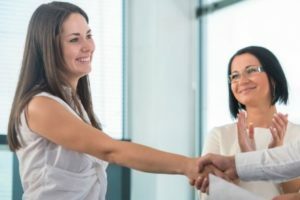 You can try to connect with the hiring managers in your interview, you can try to win them over. And you can also try to convince them that you are better than the other people who compete with you (in terms of personal traits, motivation, and attitude to the job). And what will happen in your interview? They will ask you some personal and some behavioral questions, trying to understand your motivation to work as a pharmacist, your attitude to patients, and to various scenarios that take place in a pharmacy, on a daily basis. Let’s have a look at the most common questions, and how you can answer them to make a good impression on the panel of interviewers. Why have you decided for a career of a pharmacist? What do you want to accomplish as a pharmacist, in your life, and in your daily job? Tell me about your education and previous experience. How would you deal with a stupid/irate/aggressive customer in a pharmacy? How do you spot drug seeking behavior? Do you have any experience with it from the past? Would you mind working overtime/ at weekends? What subjects did you find most interesting when studying for your degree? Do you believe to have the right personality for a job of a pharmacist? How do you ensure your knowledge stays up to date? Many pharmacy students are just following the dreams of their parents, pursuing the career someone else wanted them to pursue. Or they apply becasue they know it is a safe job, and pays extremely well. Regardless of your real motivation (it can be money, it can be making your parents proud and happy), you should talk about about some worthy motives in your interview. Your sincere interest in pharmaceutics, your feeling for the suffering of other people, and your desire to help them ease their suffering, or your strong communication and customer service skills that make from you a great adept for this job, are some of the worthy motives. Try to convince us that you do not think only about your bank account, that you see a purpose in this job. Life is a journey, from birth to death (and perhaps also besides, but that remains a mystery until we die). You should not go to work just becasue everyone else does the same thing. You should have some goals in your mind, something you want to achieve, something you want to accomplish, something that drives you forward, and keeps you going in difficult times. In an ideal case, your goal should relate to other people, to your role in their life. Show the interviewers that you see the value you can bring to the pharmacy and to their clients, that you want to bring this value to them. Convince us that you will walk to the office each morning smiling–becasue you know why you wake up and work. You can also talk about the connection of your professional and personal goals, saying how a career of a pharmacist should provide for a healthy family (your ultimate goal in personal life), how this career will allow you to raise your kids, and to give them opportunity to realize their own dream. Whether you apply for your very first job, or have been working as a pharmacist for ten years already, you should remain optimistic in your answer. Talk nicely about your former colleagues, schoolmates, about the experience at the college, about everything that relates to pharmacy. The world is full of negative people. Show us that you see the bright side of life, that your glass of life is half full, and not half empty (or at least you see it that way). Try to talk about relevant things, and explain how your experience and studies prepared you for the job you want to get with us. Drunk people, drug addicts, over-confident individuals, or unlucky people whose head is not serving them anymore–all of them will find their way to the pharmacy where you will work. And though they represent just a small minority of customers (most people will be nice, and they will understand your instructions), you should be ready to address also the minorities. Show us that you want to welcome each customer with smile on your face. Show us that you have no prejudice, and that you understand the value of each customer (everyone can spend money in the pharmacy, and everyone can do it repeatedly, if they are happy with the level of customer service). Tell us that a bad customer behavior will not affect you negatively in work, that you count with experiencing such behavior and are able to forget it in a flash, focusing on the next customer. 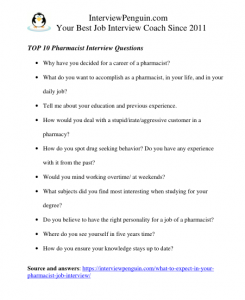 * May also interest you: Pharmacy Technician Interview Questions. People have different intentions when asking for medicine. Good hospital and community pharmacists should be able to spot drug seeking behavior. You should have a system of steps, or a list of warning signals, to tell if someone seeks drugs instead of real treatment. You have probably learned how to do this at school, and actually after a few weeks in work you will easily recognize “the type”, the person who seeks drugs. Tell the interviewers about your way of identifying such a customer. On the other hand, you should speak with love, and show the interviewers that you do not condemn people who seek drugs. Drug seekers also need out attention, and help … they are also people, members of our communities. Show the right attitude in your interview. We do not choose when we experience headache, stomach ache, or some more serious problems (such as wisdom tooth ache). Nearly every pharmacy is open at weekends, especially if we talk about pharmacies in shopping malls, or big pharmacies. Obviously, we have also our life outside of work, and nobody prefers to work at weekends. But you should show some flexibility in your answer, and an understanding for the job. You can say that you prefer to work on weekdays, but at the same time you understand that someone has to help the patients also on Sunday, and at some weekends it will be you who will serve them in a pharmacy (some other weekends one of your colleagues will have this role). You can either talk about practical subjects, or you can say that you enjoyed all subjects. The key is to show us that you understand the importance of theory, and knowledge of the field, and though you struggled with a subject or two, you always did your best to eventually pass the exams. You can even praise one of your former teachers (someone you liked), saying that they really knew how to teach the subject, and how to make it more interesting for every student. You should have some confidence (but not too much of it). People who believe to be perfect in their job stop learning and improving, becasue they do not see any areas for improvement. This shouldn’t happen to you–neither in a job interview, nor in your life. List some strengths that make from you a great candidate for this job–communication skills, empathy, understanding for the needs and desires of other people, attention to detail, and so on, and so forth. But do not forget to mention that you realize that you are not there yet, and never will be a perfect pharmacist, and that you want to continue working on your strengths, and improving your knowledge. You can dream big (and perhaps you even should), but it is better to keep your dreams secret while you interview for a job. There aren’t many career growth opportunities for pharmacists. This is a great job, it pays well, and most people are happy to do it all life long. Show us that you have some goals, goals that do not interfere with your ability to work in our pharmacy, for many years to come. New drugs are certified every day. Good job applicants should show the interviewers that they are never satisfied with their knowledge, that they always seek improvement. Accredited continuing education classes are mandatory, and you won’t impress the interviewers saying that you attend the classes. Try to show them that you do something extra. Do you read vocational magazines? Do you like to talk about pharmacy with your colleagues? Do you always search for industry news? Show us that you enjoy your job, that you understand the importance of perpetual learning, and do your best to stay on the top of the game. Try to be honest, listen carefully, show enthusiasm for the job, for the particular pharmacy, for your interviewers, for everything! Anita Stosur, author of this article, has written an excellent eBook called Pharmacist Interview Guide. She will show you great answers to twenty most common interview questions, and winning interview strategies that will help you to stand out, and get the job, regardless of the competition. You can find the eBook and read the samples here: https://pharmacistinterviewquestions.com/e-book-pharmacist-interview-guide/ . Interview follow-up call – Learn how to follow-up your interview in style. A phone call will quickly help you to get a final decision and feedback on your interviewing skills. 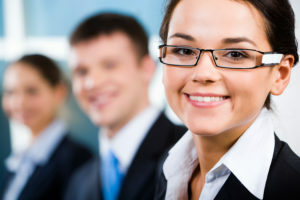 Interview attire special tips – Some interview attire tips for the brave, and for people who like to experiment. Every detail matters when you compete for a job with twenty other applicants. Choose the right dress for your interview.